It all began in the far northeastern region of Minnesota with the building of Minnesota's largest log structure, Hungry Jack Lodge, in 1916. Jesse & Sue Gapen and their two sons, Don & Bob, hand-built a fishing resort like no other in Minnesota. The Gunflint Trail, on which this log resort and its 14 cabins rested, was at this time a paradise for lake trout, landlocked salmon (believed to be the modern day splake) and northern pike. Tourists from all over the country flocked north by whatever means available. Some came by bus, others by ancient automobile. Famous names such as the Pillsbury's, Vanderbilt's, and many of the nation's top outdoor writers came to test these famous waters. It was Jesse Gapen who planted the first smallmouth bass in these northern lakes. This species soon flourished and today the border waters from Ely to Grand Marais, Minn., see modern anglers coming by the thousands to seek out this acrobatic species. In 1936, Don Gapen moved north to Nipigon, Ontario, Canada, at the end of Hwy 61, where the road was gravel. Here, the Gapen's purchased Chalet Bungalow Lodge, a 65-capacity American plan resort once owned by the Canadian Railway. At Nipigon, famous for its world record brook trout, Don and his family spent their summers and winters creating a resort for fishermen who flocked there to catch record-size brook trout, lake trout, northern pike, whitefish, sturgeon and the bountiful supply of walleye. It was here that Don Gapen created the world famous Muddler Fly and it was here that his son Dan Gapen began an outdoor career and education. Dan began as a minnow/worm boy and then as a fishing guide at the age of 14. From the age of 6 young Dan began tying flies and at the age of 8 began tying flies commercially for his father's tackle operation. Payment was a 1/2 cent for each fly. It was during this winter tackle operation the first-ever weight forward spinner lure was invented. It was called the "Nepag." 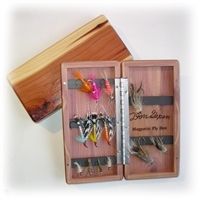 From that lure came the Paul Bunyon 66, and the modern Lake Erie weight forward spinner. The Gapen's had numerous tent camps on places such as Lake Superior's St. Ignace Island and Lake Nipigon's Shakespeare Island. Tent camps would be the base camps for many anglers seeking out their northern wilderness adventure. Gapen's had the first float plane fly-in operation in their section of northern Ontario. For planes, an Ancient gull wing Stinson and a cloth-covered Norseman were used. Anglers were whisked off north into the northern forest where enormous numbers of game fish awaited their arrival. In those years, the Gapen's float planes were restricted from traveling beyond the Albany River system. If the plane were to go down, there would be no search and rescue operation beyond this point. Dan Gapen, who now has become President & CEO of The Gapen Company, grew up in the companionship of the native Ojibwa Indian Guides, who had a great deal to do with Dan's education in this northern wilderness. Rivers abounded in this region of Ontario and it was here that young Dan gained a true love for river fishing and its rewards. The numerous Books and Videos, TV shows and stories written and hosted by Dan are evidence to this rich river wilderness heritage. It may be of interest to some of you that Jesse Gapen, Dan's grandfather, gained his fly-tying ability from his father, who came from England. This talent has been passed on down through four generations of Gapen's. Numerous patterns, which now exist in the market, were first tied by one of these Gapen men. It was Dan who broke the mold and came out with other fishing lures such as the snag-free, rock walking Ugly Bug jig in 1968, and the first bottom-walking wire sinker called the Bait Walker in 1964. Today, The Gapen Company specializes in manufacturing several lures which lead the fishing industry in functionality and innovation.